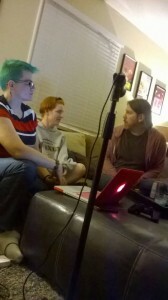 This week, we have part two of our discussion with screenwriter, author, and film critic C. Robert Cargill, which we recorded a few days after our live podcast at CONvergence 2014. 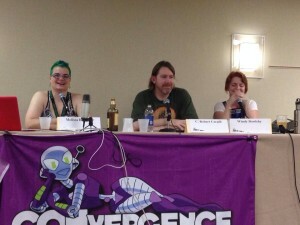 That’s right: if you were at our CONvergence panel, there is still more podcast to enjoy! Once again, we apologize for the sound quality of this week’s episode. We recorded this session on the same night as our episode with Meghan Murphy, which means we were still recording with that damned Rock Band microphone. (Don’t ever think it’s a good idea to try to record a podcast with a Rock Band microphone. You’re probably better recording with an iPhone. Lesson learned.) Anyway, we cleaned up the audio as best as we could. This week, we have a very special thing for our fine listeners: our first two-part episode! In Part 1, you will hear us with screenwriter, author, and film critic C. Robert Cargill, in a discussion we recorded in front of a real live studio audience at CONvergence 2014. In this episode, we tackle the issues surrounding writing good feminist media and tackle a very nice bottle of Yamazaki 12 year single-malt scotch. We only had an hour to talk about a very big subject, which is why the three of us got together a couple days later to record for another hour. You’ll hear that part next week! We apologize for the sound quality of this week’s episode, which contains a lot of ambient noise from the room.